Front row (L-R): Adam Howe, Karina Le Fevre, Lesley Conroy, Lisa Smith. Back row (L-R): Mel Smith, Femi Waters-Ajisafe, Laura Hunter. ‘The students have brought a new perspective and completely fresh ideas. Some of their proposals have already been implemented in the short-term and we are looking to develop others for the medium-term,’ Lesley said. It is an exciting time for Coast & Country with their upcoming merger and it is an excellent opportunity for our students to be involved in this project at this time. Karina’s project looked at promotions and awards schemes to engage the younger audience, such as a referral scheme to get more people into the social housing community. Another of the student projects proposed converting conventional homes to shared housing so that graduates have somewhere to stay if they want to remain in the Tees Valley area for work. 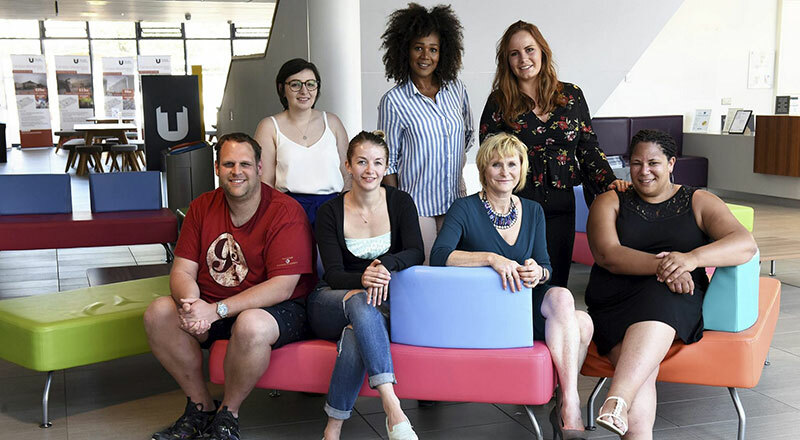 Femi Waters-Ajisafe, Senior Lecturer in Marketing and Corporate Programmes in Teesside University Business School, praised the diversity of the projects and is delighted that the students have gained real-world experience working with Coast & Country. ‘Live projects like this allow students to gain real experience of what they will be expected to do as practitioners,’ Femi explained. ‘It joins the dots between theoretical concepts and practice and helps students build their own confidence.